Automatically install Self Service on managed computers and customize the installation location. 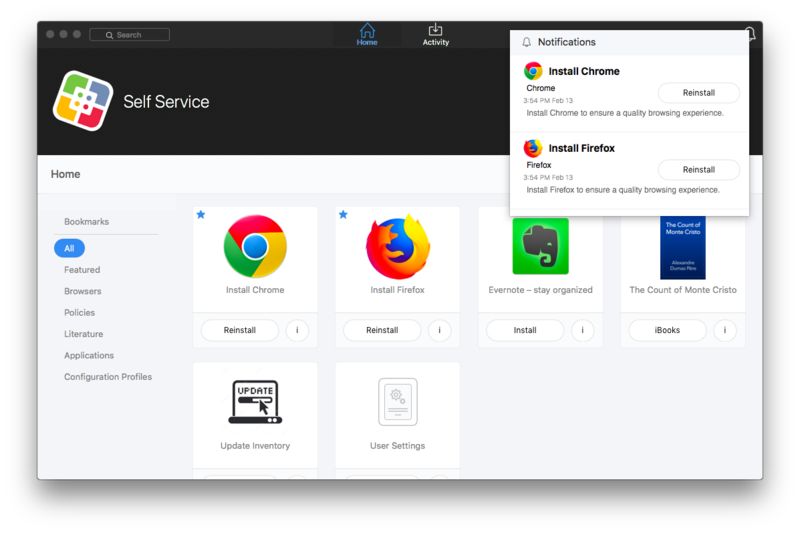 For more information, see Installing Jamf Self Service for macOS. Configure the method for logging in to Self Service. For more information, see Jamf Self Service for macOS User Login Settings. Select the category that displays on the Home page when users launch Self Service. Customize the bookmarks display name in Self Service. The bookmarks display name is populated with "Bookmarks" by default, but you can change it to meet the needs of your organization (e.g., "Websites" or "Resources"). The Self Service Configuration settings allow you to enable Self Service notifications. After enabling Self Service notifications, item-specific notification options are made available in Jamf Pro when adding or editing items. These settings allow you to add a notification for the item or software title update to Self Service only, or to both Self Service and Notification Center. For more information on which items can be made available in Self Service, see Making Items Available to Users in Jamf Self Service for macOS. Notifications in Self Service display in the Notifications list in the Self Service toolbar. A badge appears on the Notifications icon when new items or software updates are added to Self Service. You can also display notifications in Notification Center as banners or alerts in macOS. Users can click the notification to go to the item in Self Service. There are some additional requirements for displaying notifications in Notification Center. For more information, see the "Requirements" section below. Once you have configured Self Service, you may want to customize how Self Service is displayed to present users with a familiar look and feel. For more information, see Jamf Self Service for macOS Branding Settings.